Info "Just five more minutes! Now shut off that annoying alarm clock." Five More Minutes is a microgame in WarioWare: Smooth Moves, appearing in Mona's stage. 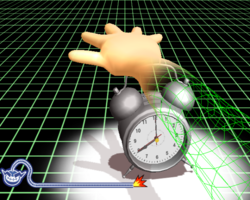 The player controls an arm and must hit the alarm clock with the hand. 1st level difficulty: The clock is near the hand. 2nd level difficulty: The clock is further. 3rd level difficulty: The clock moves. This page was last edited on February 19, 2018, at 17:21.